Let’s face it. .com is popular. Everyone knows what it is. You don’t have to explain it to anyone. .com is associated with how we think about the internet, simply because it has been around so long and because there are 126 million (yes, million) registered domain names. Maybe you’ve had inspiration recently to start a side hustle, or to showcase your artwork. Maybe you’ve got a business plan and want to launch your brand online. Either way, when you go to register the name you want, you find that your name isn’t available under .com. This article discusses what to do if your .com domain name is taken. Your first thought might be to do the classic word hack. If, say the name you want is “Smart Link”, you could get clever and snag a .ink domain name, and your website name could be smartl.ink. Another example of a word hack is if you had the name “Show Biz”, your domain name could be show.biz. Word hacks are tricky, though, because it all depends on the name or phrase you want. Keep an open mind, but don’t rely on this option. 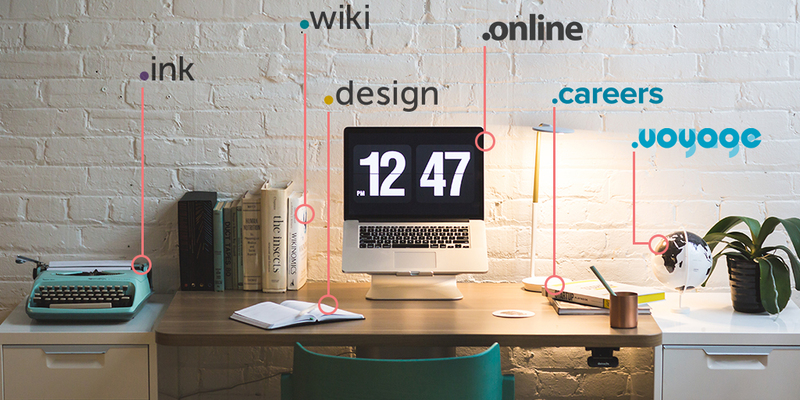 A better option is to take a look at the long list of new TLDs (Top Level Domains) available. Browse the list and see which one stands out at you. You’d be surprised to find that the domain name you want is probably related to one of the TLD extensions on the list! For example, if you have a hobby of creating glass art, you could grab a .art domain name. In fact in that scenario, a .art name would be more relevant than a .com name because it describes exactly what you do in the address bar. You make it easier for people to get that “aha” moment when their brain is deciphering what you do. Once you’ve spotted a few TLD extensions that are related to what you do, start searching for your domain name with those extensions. If someone makes 3D animation, for example, and they work with other people, they could get a domain name that has their business name, plus an extension of .studio. They could also get .tv or .video because they produce video, or they could get .design because animation is a form of design. These are just stream-of-consciousness examples, but you get the idea. Spend some time to think about how your business or your activity can be categorized. What industry does it fall under? Chances are, there is a TLD that is relevant to what you do. The more closely related your business is to the TLD extension you choose, the better. Google will reward you as well, because it looks at the content on your website along with your domain name as it matches your website with users’ keyword searches. The moral of the story is, don’t get discouraged if the domain name you want is taken under .com. There are plenty of other options that could be helpful. And it might actually be more unique. Major price increases on selected domains? We’ve been contacted by a number of customers confused about rumored price increases on Uniregistry Corporation-owned domain extensions. This article seeks to clear up misconceptions and give our customers the information they need to make informed decisions about impending price increases. Q: Are prices dramatically increasing? Should I be worried? Our wholesale cost is slated to increase at least $10 on each of these extensions and in some cases our cost at the registry will increase over $100. Most notably .hosting and .juegos will see a wholesale price increase that will result in those domains being sold for over $300/year. We’ve yet to determine our final retail prices. Q: Ack! I own domains in those TLDs! How do I avoid paying the increased price? …and click “Renew Now” to add a maximum of ten years of registration at today’s pre-hike rates. Q: How do other registrars feel about this? A: We’re already seeing the impact of this price increase ripple across the industry. Last week, GoDaddy took the extraordinary step of boycotting Uniregistry domains, prohibiting transfers in and new registrations of Uniregistry domains in an apparent protest against the price increases. We have no plans to drop support for these domain extensions and will mark up Uniregistry domains as little as possible so as to reduce the impact to our customers. Q: Do I need to worry about other TLDs following suit? A: We don’t think so. We haven’t heard of any other registries planning dramatic price increases. If anything, the prevailing trend has been a general decrease in prices across the industry and frequent discounts over a wide swath of TLDs. We will continue to keep our customers apprised of any updates to this story as it unfolds.